Are some options traders positioning for a near-term breakout? It’s the kind of thing that can make some traders wonder whether a stock is poised to break out. Markets sometimes go nowhere for much longer than people expect, and when they do move, you can never be sure about the direction—but it’s usually worthwhile to investigate high-momentum stocks that have taken a breather, especially when out-of-the-ordinary options activity enters the picture. Unlike many of the other stocks high on the LiveAction scan, WIX shares weren’t making a big move. 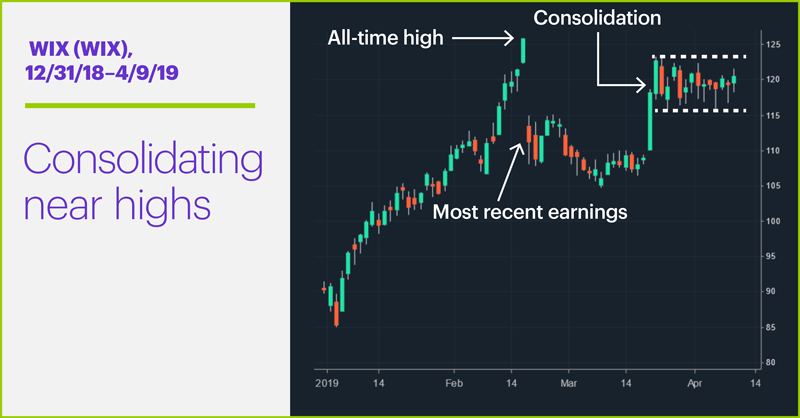 Sure, they were up more than 1% in early trading while the broad market was solidly in the red, but a quick look at the price chart (below) showed the stock was still firmly entrenched in the consolidation it formed after a 13% price surge on March 20–21. Both scenarios imply some traders may expect WIX to at least challenge its record high. 1. The call option buyers were expecting a big up move in WIX stock—that is, enough to break the stock out of its consolidation and make the options profitable before they expire next week. 2. 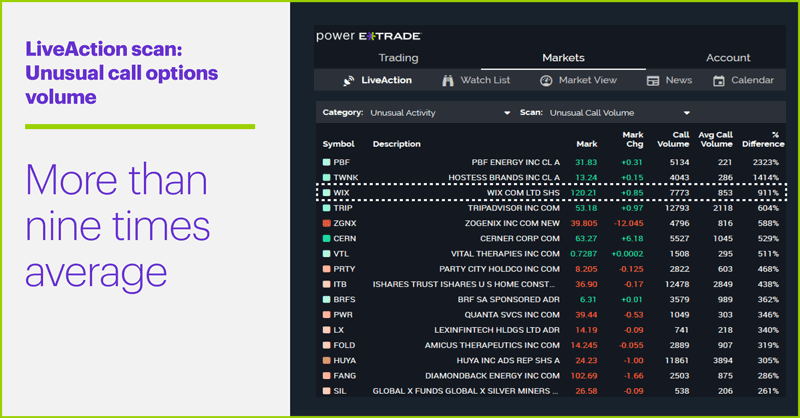 At least some of the volume in the April $125 and $135 calls consisted of a “bull call spread”—a more modestly bullish position that consists of the simultaneous purchase of $125 calls and sale of $135 calls. In this case, the trader is anticipating a move between the two strike prices ($125 and $135) by expiration, in which case the $125 calls will be in the money (and profitable) and the $135 calls will be worthless and the trader will get to keep the premium collected from selling them. Ultimately, both scenarios imply traders expect WIX to at least challenge its record high soon. That’s no guarantee traders with this outlook will be right, but at some point, WIX will emerge from the cocoon of its consolidation. Whether it flies higher or lower is uncertain, but traders may be in the process of establishing their positions. Today’s numbers (all times ET): ECB Announcement (7:45 a.m.), Consumer Price Index CPI (8:30 a.m.), Atlanta Fed Business Inflation Expectations (10 a.m.), EIA Petroleum Status Report (10:30 a.m.), FOMC Minutes (2 p.m.). Today’s earnings include: Delta Air Lines (DAL), MSC Industrial (MSM), Bed Bath & Beyond (BBBY). 1 StreetInsider.com. Wix.com (WIX) Earnings. 4/9/9. 2 TheFly.com. Wix.com initiated with a Buy at Guggenheim. 3/19/19. Gaming stocks have been on a roll so far in April. What’s behind the move? Public spending has expanded, and construction materials stocks may be reaping the rewards.